We received a few bags Softer Than Brittle to give a try. Want to know what we thought? As you know there are 2, sometimes 3 of us behind the scenes here at Mom To Grandma and we like to be a united front. When possible Brandi and I get together with our children and or grandchildren and check new things out. We unanimously decided we love Softer Than Brittle ! It has great flavor and a crunch that made even the grandchildren consider Softer Than Brittle candy. My dad ate Peanut Brittle when I was growing up all the time. It was one of his favorite snacks. As he got older and started having problems with his teeth I noticed he didn't eat it as much, then stopped completely. I'm excited for him to try Softer Than Brittle . After trying it myself I know he is going to love it. Softer Than Brittle is a soft and flaky gourmet nut brittle. This unique snack is hand crafted from a 60 year old family recipe. It contains no perservatives, cholesterol, dairy or hydrogenated oil and is vegan too. It features a clean label with just six or seven basic ingredients. 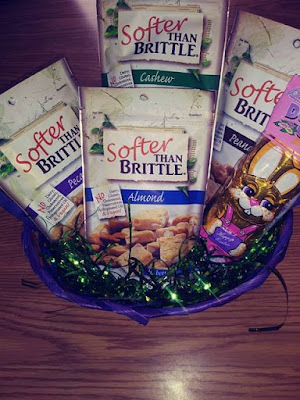 My family loves Softer Than Brittle. I like that this is a healthy snack that they ask for. I also am going to be getting my dad a batch that he can enjoy. Melissa Diedricks is passionate about family traditions. She took her grandmother Marcia's long established secret recipe for a unique, soft & flaky peanut snack and formed Softer Than Brittle, a delicious gourmet treat that is like no other. Plus its naturally gluten & dairy free as well as vegan! These sound so good! I am severely allergic to gluten and I miss sweets the most! These would be a perfect sweet snack! Softer Than Brittle sounds so good, I would love to check these out. These would also be a great snack option for my grandmother. I want to try it! Healthy snacks are so useful! have a great day! These do look tasty. My daughter is allergic to all tree nuts and peanuts but this is a great option for someone who doesn't have these allergies. I'm glad there is an option for snacks for my vegan friends. I like that it is made with clean, simple ingredients. 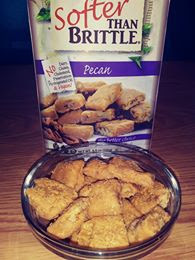 I love nut brittle, so I would be really interested in trying this. Wow, these sound really good! I love peanut brittle as well but you're right - it is super hard on your teeth. These seem like they would do the trick of being tasty AND tooth friendly. I'll have to check them out! These look really good. I think I've seen these at the store before, now that I see your review I will have to check them out. These sound like a lovely alternative to chocolate this Easter. Especially for those who are gluten, dairy free and vegan! Lovely idea. Congratulations on having developed Softer Than Brittle. What is good about this is not only s it healthy but it also a tradition over which the family bonds. They're not in our stores yet! But vegan and gluten free? Count me in! As soon as they get in our stores! I love brittle. I haven't had it in awhile but enjoy it when I do have some. I have never found a brand I didn't like. I do get the necessity of a softer brittle because brittle could be dangerous for older frail teeth. I wouldn't mind checking this out. Flaky nut brittle sounds divine! I make peanut brittle and try to make it not as hard as the normal one, but flaky sounds fab. Glad to know that you love it! I've never tried this before and I'm curious about the taste. I'd love to get some for my family. It's healthy too which is a huge plus for me. This sounds like a tasty snack. I can't see that there are any stockists in the UK though, or I might be wrong!